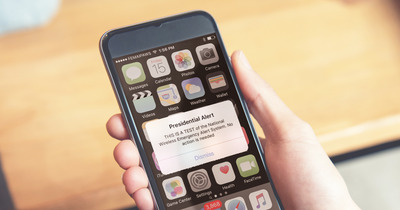 You might have been alarmed when your phone suddenly buzzed with an emergency alert from the president Wednesday afternoon – luckilly, it was only a test. But unlike the emergency alerts and AMBER alerts that you can toggle off on your smartphone, you’re not able to switch off the notification for this “presidential alert,” which is designed to be used “in the event of a national emergency,” the Federal Emergency Management Agency says. In theory, anyone with a wireless cell phone should have received the test emergency message Wednesday anytime between 2:18 p.m. Eastern and the half-hour window that follows. This is the first time the government has tested the national emergency alert system. The test was originally scheduled for Sept. 20, but was postponed so FEMA could focus on responding to Hurricane Florence. FEMA first created the alert system to adhere to a law passed in 2016 under former President Barack Obama, which gives the president the ability to send out nationwide alerts addressing public safety issues.